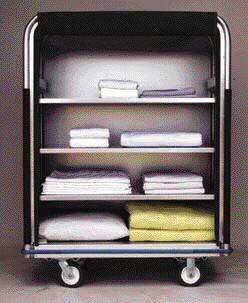 What options are available for very lightweight linen trolleys that can stand up to daily use? Most of the standard linen trolley models will have frames made of very lightweight aluminum which is an ideal material for several reasons. It is resistant to staining and rusting and it is also very scuff and scratch resistant in typical use. However, for another style of lightweight option there is also PVC construction. This very strong yet very light material is used in a wide variety of items within hospitals and health care facilities. Like aluminum and stainless steel PVC is does not rust and it is resistant to molds and mildew. The bins or baskets of the linen trolley can be made of a variety of different materials. A very lightweight option is a canvas or vinyl bag that fits into the frame of the cart. These can be easily removed from the frame to lift the entire contents and transfer it to a washer or sorting area. Poly or fiberglass shelves, bins or cabinet types of options do not add a lot of weight to the frame but provide more options for using the cart with pre-sorted clean linens. Staff can easily glance at the shelves and remove the supplies needed in each particular room of the hospital. 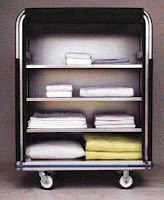 With optional covers that can be rolled down or placed over the open sides these linen trolley models will quickly convert to clean linen storage units. 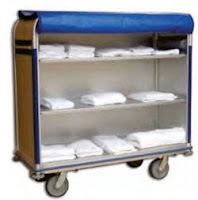 Covers can be made of mesh or vinyl depending on the particular style of linen cart and the needs of staff. Is there a good option for keeping laundry from different patients or rooms separate in an efficient and effective way? A resident cart that has wire or plastic bins is really the way to go when you need to move a variety of different items between the laundry and the rooms. Each room or person can have his or her own bin or shelf that is divided off from and separate from anyone else's laundry. The linen trolley shelves or baskets can be labeled with room numbers or names so there is never any confusion. In addition smaller linen carts of any style can be used in particular rooms. These can also be identified on a label card and kept separate through the entire laundry system. 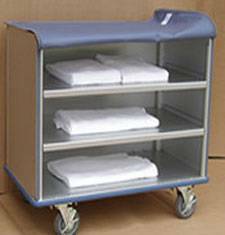 Rolling hampers are another popular option for use in a patient room or in a particular area of a facility. Rolling hampers offer the option of larger items being moved to the laundry that may not be appropriate for smaller bin designs. How flexible or adjustable is a linen trolley for carrying a variety of different linen items within a facility? Depending on the style that is selected there can be a wide range of options for changing the configuration and storage space in the cart. Most designs will have fully adjustable shelves that can be moved to create larger spaces for bigger items or smaller spaces for small items. Most designs offer the adjustment along a pre-set track which means there is no need for specific types of tools to change the shelf. The shelves can be easily locked into place with the use of clips and insets to prevent the shelf from moving or sliding when the unit is in motion. Other systems allow bins and dividers to be added to selves to create various configurations for storage. Some carts may offer the option of a full bulk type bin or the option for shelving. These turnaround bins allow the shelves to flip up against an open side, creating a wire wall to allow bulk storage. Simply flipping the shelves down on the support pole turns this full bulk bin into individual storage areas that can be accessed from the open side of the bin. This is a cost and space saving idea if a facility wants to have various storage and transport options using the same trolley.